How to secure Webmail (HTTPS/SSL) in 2019? I quickly skimmed through docu and community, and am surprised that there are obviously issues with webmail when it comes to HTTP vs HTTPS. Did anyone figure out yet how to do this? 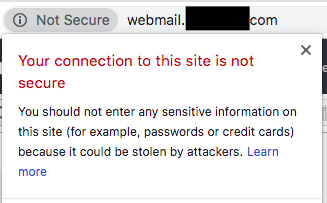 I can access my webmail only insecure and am concerned about that. EDIT: Just figured out that I can access it via https://webmail.dreamhost.com/ instead of https://webmail.mydomain.com. The latter does not work at all, I must use http instead of https. But the first one actually works. However, what does this mean if I want to use this email via Client? What are the SSL Settings for it? Obviously this is simply obsolet information and the webmail link including the personal domain name should not be used anymore. However, somehow I got to this link, so it obviously was somewhere in the panel or email from Dreamhost and confuses new users.